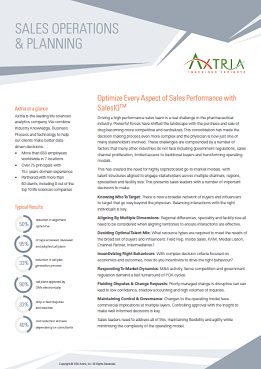 Axtria SalesIQTM is a cloud based sales operations platform with integrated Territory Alignment, Call Planning, Incentive Compensation and Field Reporting. Built on Force.com, the platform provides a rapid accelerator to deliver sales planning and operations capabilities to Salesforce and Veeva customers. Download the datasheet to learn more about our Sales Planning and Operations capabilities.